Green Cuisine offers a complete spectrum of nature's finest nutrient-dense superfoods. 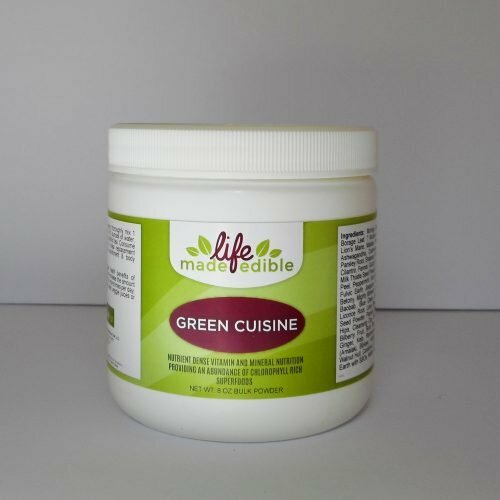 In our powdered form, Green Cuisine is quickly and easily assimilated in the digestive tract. Taken regularly, this blend will provide you with an abundance of chlorophyll, vitamin, mineral, protein, amino acids, and thousands of nutritional compounds that are essential to maximum health. No vegetables have been added to this superfood blend to insure the most concentrated nutritional profile possible. Recommended Daily Maintenance: Thoroughly mix 1 level tablespoon with 8-12 ounces of water, fresh vegetable juice or hot/cold herbal tea. Consume as a meal additive or meal replacement to increase energy, nourishment & body alkalinity. To realize the greater health benefits : Thoroughly mix 1 level tablespoon with 8-12 ounces of water, fresh vegetable juice or hot/cold herbal tea 3 or more times per day. Ingredients: Nettle Leaf, Yacon, Alfalfa, Borage Leaf, Morning Oleifera, Mushroom Blend (Chaga, Cordyceps, Lion's Mane, Maitake, Reishi, Agarikon, Turkey Tail), Ashwagandha, Codonopsis, Eleuthero Root, Fennel, Hyssop, Parsley Root, Peppermint, Shatavari, White Oak Bark, Bringraj,Cilantro, Guduchi, Hawthorn Berry, Ho Shou Wu, Milk Thistle Seed Powder, Nettle Root, Nettle Seed Powder, Oatstraw, Orange Peel, Suma Root, Brahmi, Dulse, Humic & Fulvic Earth with SBO's, Jiaogulan, Licorice Root, Parsley Leaf, Spirulina, Wood Betony, Mighty Minerals, Artemisia Annua, Baobab, Blue Green Algae, Devil's Club, Horsetail, Lotus Seed, Marshmallow Root, Plantain Leaf, Peony Root, Rose Hips, Cleansing Clay, Schizandra Berry, Evexias Clay, Bilberry Fruit, Birch Bark, Coriander, Dill, Fenugreek, Ginger, Kelp, Rehmannia with Kudzu (4:1), Stevia Green Leaf, Triphala (Amalaki, Bibitaki, Haritaki), Black Walnut Hull, Cardamon, Laminaria Juice, Sana Clay. Detoxifies the body of heavy metals, chemicals, radiation and creates an environment in the body less suitable for pathogens of all kinds. Recommended Daily Maintenance Use: One pint to one quart (your preferred amount) of pure clean water, or herbal hot/cold tea to 1 tablespoon Hydro-Clay & Mineral Infusion. May be taken with health supplements and food (clay makes them more bioavailable), but separately from chemical (pharmaceutical ) drugs by at least 2 hours (if taken together, the clay will absorb toxic substances like chemical drugs, thereby reducing its effectiveness. If drug withdrawal symptoms are noticed, discontinue the Hydro-Clay & Mineral Infusion Drink and consider alternatives. Be particularly cautious if you are on antidepressants or blood pressure drugs as these are some of the most addictive and harmful of the pharmaceuticals. 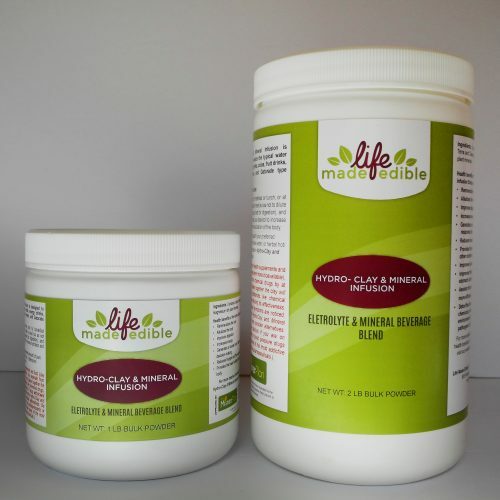 Ingredients: Contains a blend of mineral-rich Terra and Cleansing Clays, and magnesium rich plant minerals.